I have finally done it! The drag jacks are finished and I couldn’t be more pleased. They have turned out really well and as an added bonus I have learnt so much about my new welder and all its myriad of settings, which gives me the confidence to use it to tackle the next job… …welding the tabs for the dzus fasteners on to the funny car chassis. Anyhow, back to the drag jacks. I have spent the last few days lifting myself up and down on them in the conservatory much to the amusement of my dog Tommy. I don’t know why but he looks at me as if to say, “aren’t you a bit old for this?” but delivery of another biscuit seems to settle that question! As you can see from the pictures the change in ram size (inadvertent mistake by me) did alter the angles which meant that the lift arms rather than sitting 2 inches off the floor, are about 4 ½ inches. This is no problem as the rear of the funny car accommodates this and at the front we will use a couple of motorhome levellers to sort this. Other progress this month has been the internal panels for the chassis. I made some plywood mock ups and put these up against the chassis to ensure we had them exactly as we wanted. I know you can use cardboard to make the template which I originally did but transferring this to ply gives me something more substantial to work from and provides a useable pattern if we need to replace them at any time in the future. As always thank you for taking the time to read my meanderings. We are inexorably getting closer to marking off some of the myriad of jobs we need to complete, to get the car ready. I could blame Brexit, Trump, EU or Nicolas Maduro but in the end it is down to time and money as it always is for any one that races. Let me wish you all a Happy New Year, I hope that your dreams and aspirations all come true. For the first time I can remember have a New Year resolution. For 2019 due to my poor posting regime I am committing to post at least once a quarter, more often if we progress more quickly. 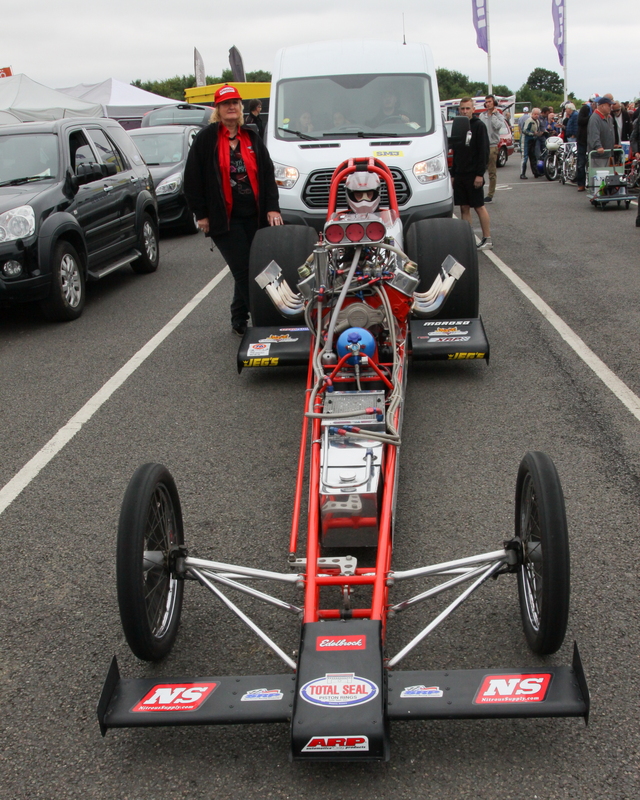 On that note I was hoping that by now I would have more to report on the build of the Funny Car…. but I can’t! We seem to be in a chicken and egg situation, with the contents of my old dragster trailer cluttering up my garage to the point where I don’t have the space to fabricate the new tin work. However, there may be a light at the end of the tunnel as I have managed this week to secure some storage space so I can get ready for the aluminium sheets to be delivered. Although progress has been slow on the car I have started fabricating the new race jacks. I have always eyed the air hydraulic Pro Jacks with envy but as I have other more pressing requirements for the money they would cost me I decided to make my own. After all, how difficult can it be? As it turns out, very difficult!!! Although the concept is pretty simple and the fabrication straightforward the devil is in the detail. Getting the geometry right even with the aid of a sketch has proved to be problematic. Added to this my trusty old tig welder decided to go pop and as I need to weld aluminium I decided an upgrade was on the cards. So after much perusing of the web I settled for an R-tech unit which comes with a foot pedal, something I never had on my old welder. As I have found, this is very different to a throttle pedal, and my usual approach of mashing it to the floor required re-evaluation in order to control distortion! I now have had time to practise and love it. So armed with my sketches I ordered some hydraulic rams from Greed Bay. They duly arrived and this is where my troubles started. I needed rams that would fit inside a 50mm box section. However, these were 60mm. No problem I thought I’ll order box section with a 60mm inside diameter. However, the best fit was 70mm with a 5mm wall. This was bloody heavy but got me out of a hole. I could always lighten it later. So the next part was to make a jig board so I could lay it all out and use it to tack everything together. The first problem was distortion, so I made other jigs to weld tubes together as you can see from the picture which worked really well. So Mark 1 had to be scrapped so it was on to Mark 2. This was all going to plan until I had a disaster… …the regulator on my argon bottle decided to throw a wobbly just as I was welding a critical stress point! As these jacks are going to support the funny car with both myself and the crew lying underneath I am not prepared to risk anyone’s safety so the only option is to start again. So Mark 3 was born! This seems to be going better. I have uncovered other issues caused by changing the size of the hydraulic rams, which has had a positive side effect as my CAD skills are getting a boost. I recall that Edison was once asked about the number of times he had failed in making a lightbulb. He replied that he had found 1000 ways not to make a lightbulb! I feel a bit like him at the moment! So, in conclusion, I am slowly moving forward and hope to complete and test them in January. Oh and one more thing. If you are tempted to build your own race jacks do a lot of research and if you can afford it don’t!!! It is with mixed emotions that I am writing this blog. The Andromeda slingshot has gone to its new home; in Finland! It was a strange feeling, seeing the trailer with the car strapped in it on the dock side, in the rear view mirror of the truck, knowing that we wouldn’t be seeing it again. I know we shouldn’t get attached to racing cars but somehow they get under your skin. Perhaps, it is the time and effort expended on them. It is weird having a big space in the garage where the slingshot once lived. However, as we are starting to work out all the things we need to do I have started it filling it up. And a rather alarming rate! But, this means we are now clear to really get going on the Funny Car; or we would be if my order for chassis tabs and fittings was any closer to being delivered. They were ordered in February and still no definite delivery date! I am looking at alternatives. There has been some progress. So far I have managed to fabricate the front tall body stand and a smaller version for travelling in the trailer and worked out the parts list for completing the engine. I have to say I’d forgotten how much work is required to get a race car ready and at the moment it all looks rather daunting. Sometimes I think I have taken on a bit more than I can manage but onwards and upwards as they say. I have know realised that all the header pictures we have need changing but a half finished race car does not make a great poster child! 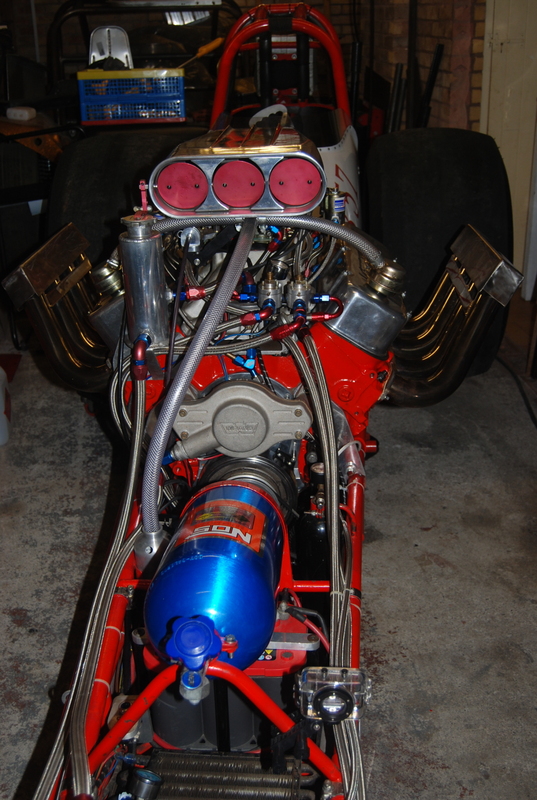 So it begins – Blown Methanol Funny Car! According to Facebook it has been 289 days since I last posted! Wow, doesn’t time fly, and thank you if you’re reading this I really do appreciate your patience. I would like to unveil our new car. The body is Carbon fibre and needs serious paint. There are still a lot of parts to be purchased and work to be done but the basics are all there. The first few jobs have been completed with the steering column and pedal now fully welded after my initial fitting in to the chassis. Also the engine, Bruno and Lenco have all been fixed in so we can get an idea of space for the coupler and drive shaft length. One of the big changes has been for us has been the change of powerplant. After setting my heart on a blown Chevy we came to realise that to fit it to the chassis was going to require some serious reworking of the chassis and we had no idea how this would translate in altered handling as the chassis is built with the engine and transmission at a certain height which didn’t translate the same with the Big Block. 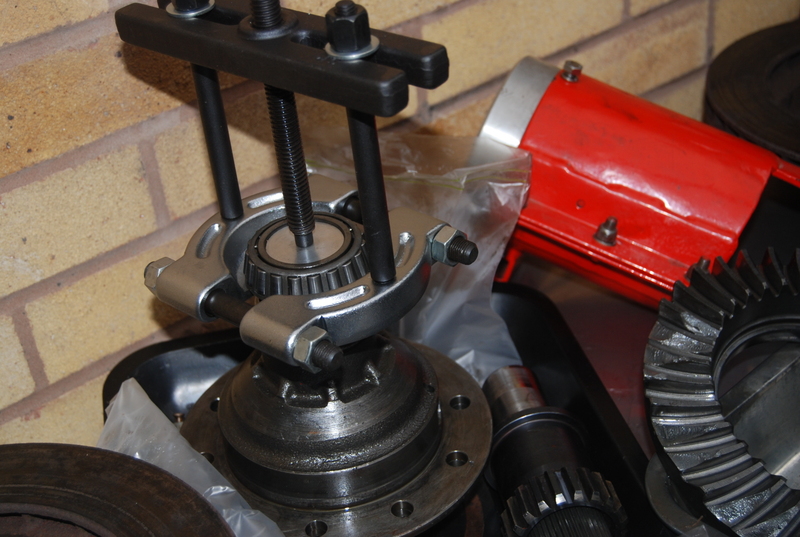 Anyway, by pure luck a BAE motor came along just at the right time and fits straight in without any chassis mods. The BAE motor is new to me and the crew but I am excited to finally be running a Hemi. So another of my wants on the wish list has been fulfilled. What we are hoping to do is get the chassis completed by the end of the year, whilst we also work on the body with the intention of getting out at some point next year. At the moment Chris and I keep walking round the garage looking in boxes and deciding where the parts go and making lists of jobs. But now we are starting work and I will keep you updated. P.S. The slingshot, trailer and awning are available as a package. Just hook up and go racing! I’m looking for £16,000 or nearest offer. …do we keep running the slingshot and make some major changes, or go in a completely different direction? If you’ve read any of my previous blogs I’ve talked about selling the car, and in my mind I’d envisaged this to be when we ran 8.50. However, even though we ran this quick the motor is set up so conservatively we could potentially go much quicker with what we’ve got! And without making major changes! But, and this is a big but, I’ve hankered for a funny car for as long as I can remember and as I’m not getting any younger (no further comment needed!) this weighed heavily on my mind as part of my decision making process. The decision has been taken! The slingshot is going to be sold to make way for a new car. At this moment in time I’m currently in the process of doing a deal. Once the deal is finalised I’ll let everyone know and put up a few pictures. So yes, it is the end of an era. I cannot begin to say how much fun the slingshot has been and I’ll be sad to see it go. However, this is a great car for someone to get in to drag racing. I’ll send out an update in a few weeks so please bear with me. P.S. If any of you reading this fancy owning the slingshot please let me know. Dragstalgia 2017 – They say its all over… it is now! As I write this blog I realise that I have missed reporting on the results from the previous two race meetings, Spring Nationals May 27 – 29 and Nostalgia Nationals June 24-25. So for completeness, here is a quick precis. The Spring Nationals at Shakey showed us moving forward again with the motor and we were heading towards our best normally aspirated time of 9.30 but I was still not completely happy and was looking forward to the Sunday. Unfortunately, a family bereavement meant that I made the decision to leave. The Nostalgia Nationals was our next attempt to get back to our best. After a couple of clean normally aspirated runs the decision was taken to switch the NOS back on. However in my haste to get to the track I had forgotten the fly leads for the bottle heater which meant we would have to run with a lower than ideal bottle pressure. That being said we managed an 8.8, two 8.6’s and then on our final run we ran a personal best of 8.62 at 150.00mph! This whetted our appetites for the next meeting, my favourite of the year, Dragstalgia at Santa Pod. We had the option to run on the Friday but my superstitious nature kicked in as we had broken the diff on the same day the year before. So I decided we would take the opportunity to completely clean the car, something I haven’t done for a while. Much to amusement of some of my fellow racers! Saturday morning arrived and although it was overcast we were called to the pairing lanes. Sadly the greyness turned in to rain which persisted well in to the afternoon. After the best efforts of the Santa Pod track crew we finally managed to get a run in. A creditable 8.86 was a promising start so we prayed to the weather Gods for a good day on Sunday. Sunday morning arrived and as the Sun penetrated the awning we knew our weather prayers had been answered! The scheduling meant we were out first and although the burnout wasn’t great we ran an 8.66. I did feel a jolt and thought we might have damaged something. Then the penny dropped… …I’d forgotten to change the NOS bottle! Doh! It was completely empty. So armed with a full bottle we went again and ran a new best time of 8.57, but again the burnout seemed a little weak. A number of comments about the amount of grip on the startline and increasing tyre pressures got us thinking so we decided to do the same. I felt there was still more to come so we looked forward to the last run of the day. An improved burnout a strong launch and an extremely strong run all the way to the finish was a brilliant way to end the meeting. What we didn’t expect was the time, 8.47 at 151.56mph a personal best both in ET and mph! And this leads me to explain the title of this blog. I have held a desire to build a new car for a number of years and move in a different direction. So I have decided to sell Andromeda to fund the new car. I could not have asked for a better car and am sure the new owner will enjoy the experience as much as I have. So long for now and I will keep you informed on how we progress. And then all my teeth fell out! After the euphoria of Dragstalgia it was time to get down to the serious work of stripping the back axle out of the car. I have never done this since I have owned the car so this was new territory for me and I was surprised at how much of the car needed to come apart to get it out. As it turned out I took the diff out of the case which made the whole thing more manageable. 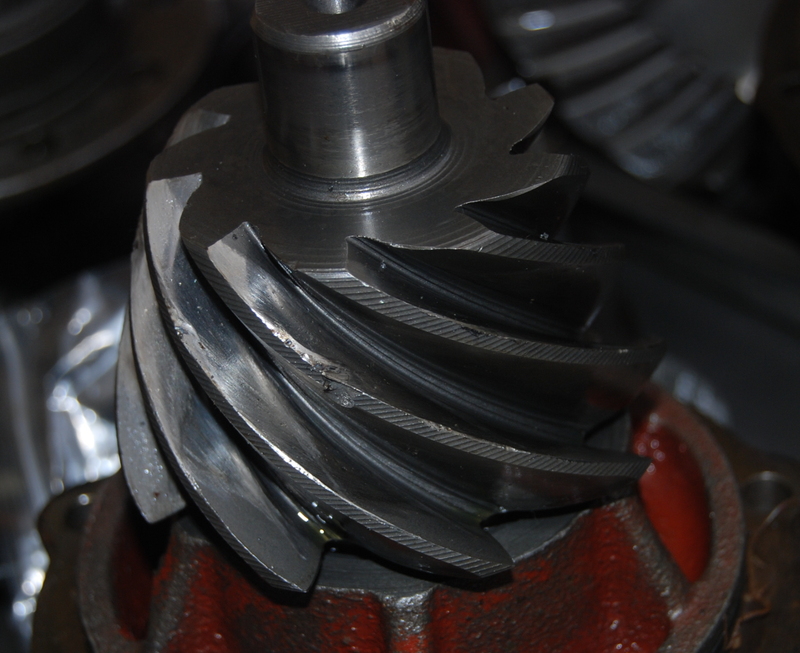 With a certain amount of trepidation I inspected the diff and as you can see from the pictures we have stripped teeth off the crown wheel and damaged the pinion so that is scrap. The teeth were sat in the bottom of the casing and I can only assume that the racing gods were on our side again as incredibly they had not jammed whilst I was running. A situation I fear would not have ended quite as pleasantly as it did. Just for good measure I checked the bearings to see if we could salvage anything, I was being horribly optimistic. 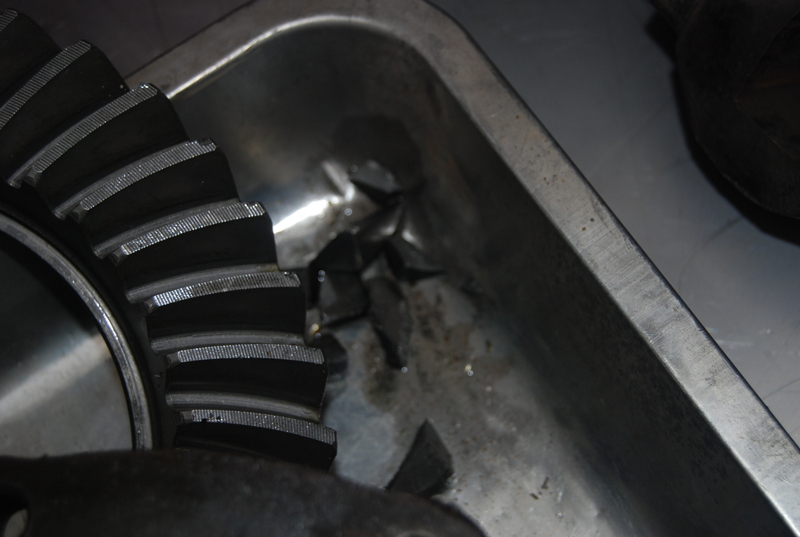 Ho hum, every bearing in the axle is trashed. It appears that the little metal filings you inevitably see from damage like this had been round all of the races so they’re toast as well! So now we know what we’re facing its time to order all the bearings shims and gaskets. 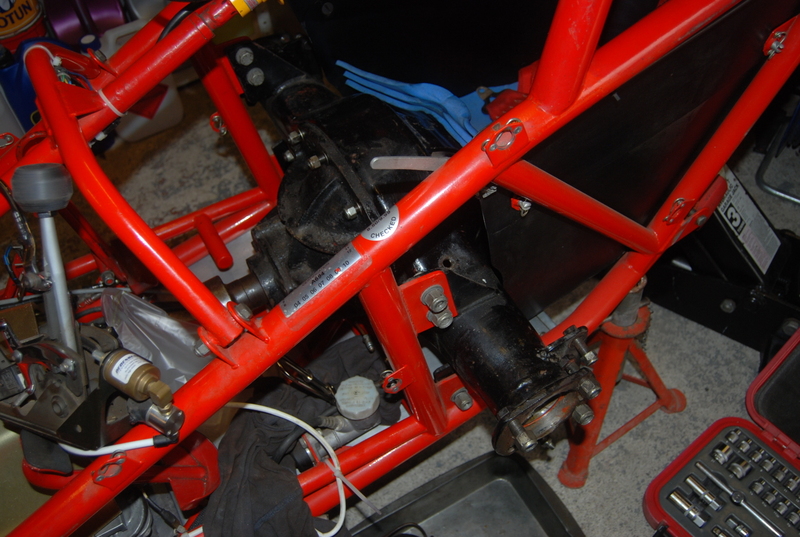 Then I’ll source the gears and axle shafts so we should be back up and running fairly soon, however, because of other commitments outside of racing it is highly likely that we won’t make it out again this season which is slightly irritating, but that’s life as they say. So it appears that since I decided to sell Andromeda she has reacted a bit like Stephen Kings Christine without the added advantage of repairing herself which would be quite a useful feature; for all drag racers I suspect! On a slightly different subject a number of people have asked about the website, or lack of one! I have not really got my act together on this and hope to start the process of designing a new site as soon as possible and will let you know when it’s ready. If you know anyone who would like to read this blog or like our Facebook page please let them know about us. We would love to see them! Of all the meetings I had been looking forward to on the racing calendar then Dragstalgia was the one. Over the last few years it has developed in to probably the best nostalgia meeting in Europe and the variety of interesting race cars and bikes seems to get larger every time it takes place. We arrived Thursday afternoon as we wanted some time getting the car fettled and also take the opportunity to run on the RWYB day on Friday to get the car. Our intention was to get the base motor finally settled and then turn the NOS back on. Friday morning arrived and the weather was glorious so anticipation was high. Looking at our data it was clear that we needed to keep leaning the mixture so we put a setting in to the carb and took it out for its first run. Whilst it had ticked over in the pits it steadfastly refused to do so in the fire up lane and I did the drag racing equivalent of rubbing your stomach whilst patting your head! I also nearly managed to run Chris over as he was bringing me to the line. The result was a Red light and the motor only managed to settle down at half-track at which point it covered me in oil. Fortunately this was just a rocker gasket that had dislodged itself and I had not oiled the track which was a relief. Back at the pits a quick plug check showed we had gone over the edge and it was leaner than we were happy with. So we tried a slightly different jet combination. At the start line the car seemed to launch ok with startling large plumes of black smoke but then it was all over the track and I’m pretty sure that I covered a lot more than a quarter of a mile! As Chris towed me back to the pits there was a strange sound coming from the rear axle. Putting the car back on the stands and firing it up again it was clear that all was not well and a large mechanical clunking confirmed our worst fears, we had broken the diff! Now as this was Friday this was probably the worst case scenario. However, we had booked for the weekend so decided to enjoy the rest of the weekend and sort the diff out when we were back at home. 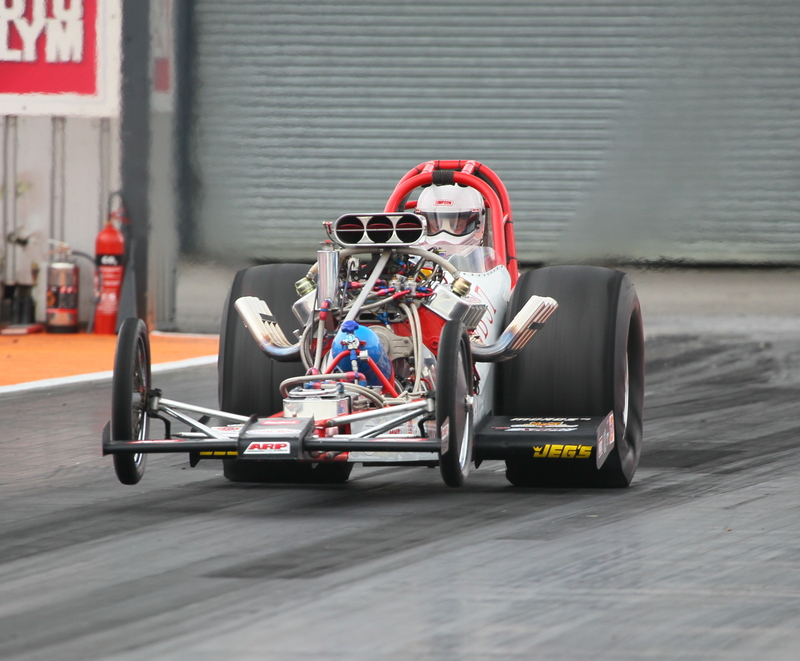 And what a weekend it was, if you’ve ever wondered about the roots of drag racing then Santa Pod is a brilliant place to start your education with cars from the roots of UK drag racing in the shape of the Allard Chrysler and bikes like Pegasus and Hobbit. A sight for all the senses is probably the best way to describe it. A number of things stick out in my mind, firstly our friends Steph and Dave Milam of She Devil racing produced a barnstorming run of 6.18, the fastest in Europe for an Altered, secondly the UK v USA matchups which were absolutely brilliant and many thanks must go to the guys for travelling across the pond. And finally the overall atmosphere at Santa Pod: We were pitted next to a French and an Italian team and there were Germans, Dutch and many other nationalities present and guess what, we all got on! Drag racing has a way of uniting people in a way politicians can only dream of. On a personal note it was great to see Simon from Eurodragster and finally put a face to the voice, and thanks to the Santa Pod team who put on a great show and last but not least all those people who tried to help us. Back at NWR HQ the strip down has begun and as you can see from the pictures so far we have found that we need new driveshaft’s and this is before we even got to the diff proper. Next job is to get the whole axle out and see what else we’ve done! As I write this I realise that it has been a few weeks since our last meeting, the NSRA Nostalgia Nationals. A brilliant meeting with fantastic cars was expected and although the meeting didn’t disappoint our time was somewhat less fun. We had run the car in the pits and all seemed to be heading the right way. Then, the Xmas tree lights packed up and when we finally got to run it was to be by flag start, just like in the early days of drag racing. Something I’ve never done! So we pulled round to do the burnout and the motor seemed strong however, reversing back it started sounding a little sick and then stopped completely. So we had to tow it all the way back to the pits and investigate. As the rain had set in we decided to call it a day and get up early Sunday. We started by checking everything we could think of, electrical, carb, and fuel all to no avail. So next was to take off the rocker covers and see if we had damaged anything. It was then we discovered that two lash caps were missing off the top of the valves! 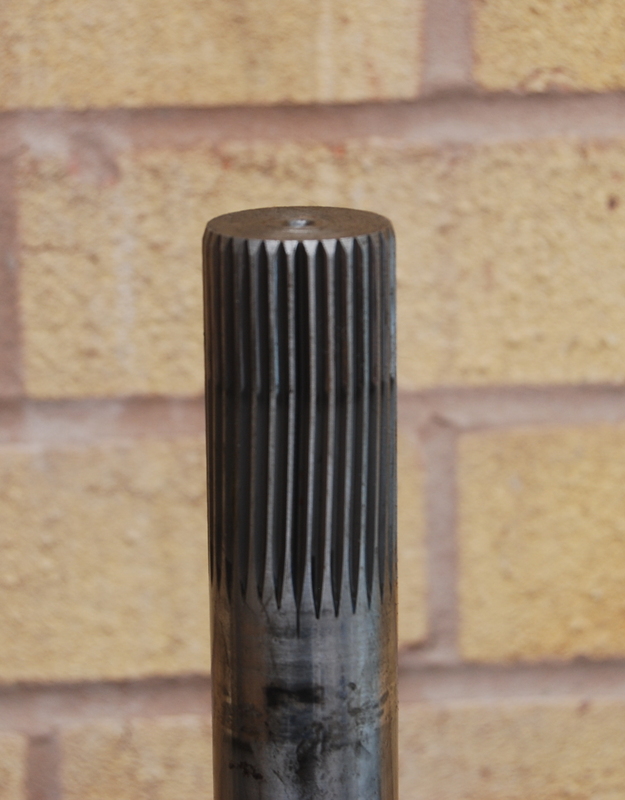 This gave us valve clearance you could measure in millimetres! As they had dropped in to the engine there was no alternative but to take it all to pieces and find the caps and see if we had suffered any damage. So that’s what I have been doing over the last couple of weeks. I decided that if I would strip the motor in the car rather than taking out completely. 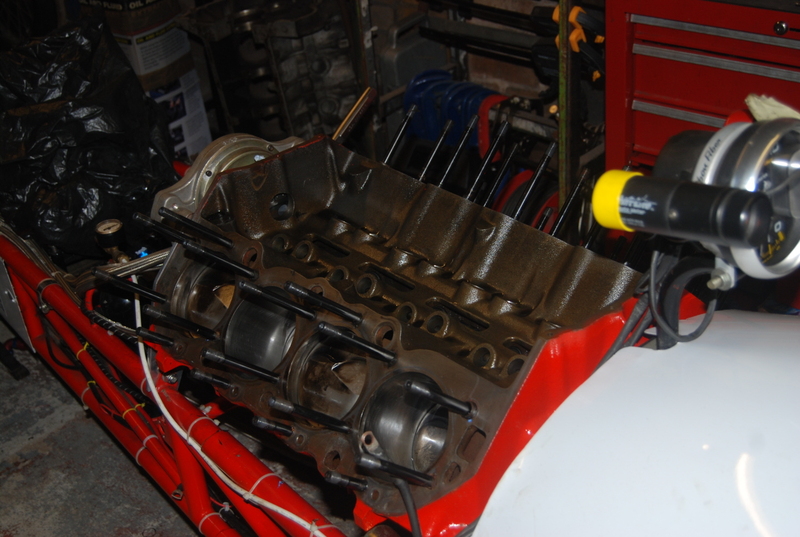 Although access was reduced I had no trouble in getting the heads and sump off. Both lash caps were sat in the valley and a quick check of the pistons and bearings confirmed that nothing else had happened in the engine so we had been really lucky. The only thing I did do as a precaution was change both valves where the caps had come off. We think we have identified what caused the issue. In the burnout I noticed the rev counter go quite high and I think we suffered some valve float which spat the caps out. We have now reduced our rev limiter so this doesn’t happen again. So everything is rebuilt and we’re ready to go. This weekend is Dragstalgia at Santa Pod and we are almost packed up and ready to go. All ready to go racing! So all I need now is the car to start performing like it should and we will have a fine weekend. I’ll keep you posted! After our previous meeting’s success we were looking to make further inroads in to our times and creeping up on our tune seemed to be bearing fruit. A quick review of some of the data we collected suggested we had some previously undiagnosed carb issues. 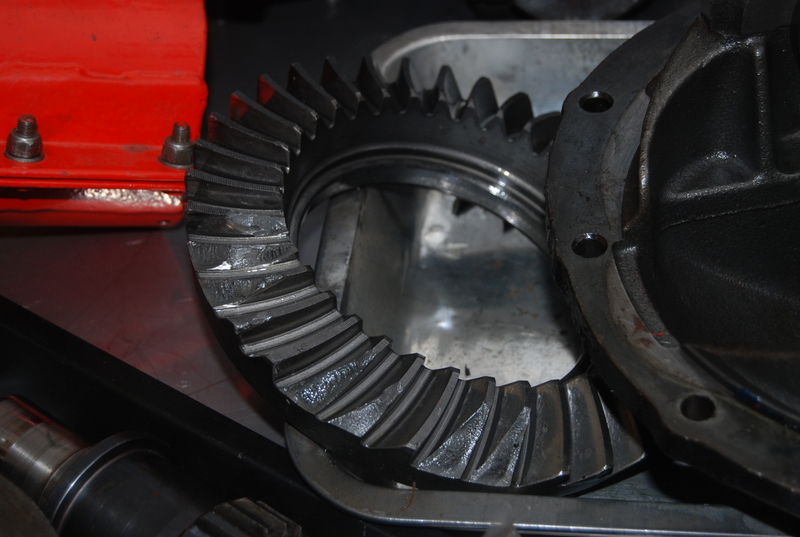 These were resolved easily but this has resulted in us going back to basics with our jetting. So after getting the car ready we set a jet combination, which, if my hunch was correct would prove to be too rich but provide a better idle after the burnout which had been causing a few issues. The car launched with a stutter before pulling cleanly. However, the plugs told their own story and we are still some way off the jetting. So a quick change and we were ready or the off. However, the weather gods were not being kind and continuous rain prevented us from running the rest of the day and waking Sunday morning to the sound of rain on the caravan roof meant that it was unlikely we would run at all. At about 11 o’clock the track called the meeting a rain off and so we decided to take our time in between rain showers to get everything packed up. So we are all ready to go again and hopefully if I’ve got it right a couple of runs should put us back where we want to be ready to switch the NOS back on again! I never seem to get chance to say thank you to all the people who make our drag racing fun so I would like to call out to Claire in The Wild Bunch for keeping us all in order, all of the racers and finally the track staff at Shakespeare County Raceway who work tirelessly for us. See you at the track next time!